Meizu has launched its first smartphone with dual displays and dual rear cameras in India named the Meizu PRO 7. 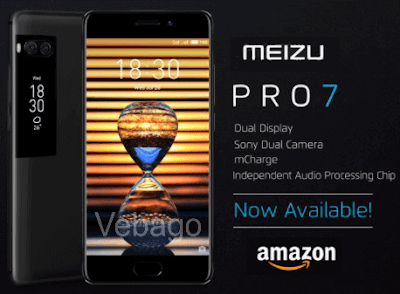 The Meizu PRO 7 is exclusively available on Amazon.in and comes in Black color option which is priced at Rs. 22,999. As per the official Meizu India Twitter Account, The smartphone is available in Limited stocks only. The smartphone runs on Android 7.0 (Nougat) based on Flyme OS 6 and is powered by a 2.5GHz Octa-core MediaTek Helio P25 processor with Mali-T880 GPU for graphics. The Meizu PRO 7 has a unibody metal design, Fingerprint sensor on the front, and the device measures 147.62 x 70.72 x 7.3mm and Weighs 163g. The Meizu PRO 7 is powered by a 3000mAh battery with mCharge fast charging support and sports a 4GB of RAM with 64GB of internal memory storage. The device comes with a 5.2-inch Full HD Super AMOLED display with a resolution of 1920 x 1080 pixels and a 1.9-inch secondary Super AMOLED display with 240×536 pixels resolution. Coming to the camera, it has a 16MP front-facing camera with f/2.0 aperture and 12MP + 12MP dual rear cameras with f/2.0 aperture, dual-tone LED Flash, PDAF that offers portrait images with background blur. Connectivity options on the device include 4G VoLTE, WiFi 802.11 ac, Bluetooth v4.2, GPS, and USB Type-C.